“Lackey has orchestrated an emotionally moving, multimedia work called Ritual of the Body Electric.” – Nick Malewski, Kansas City Star - September 4, 2008. The music of William J. Lackey has been performed by The New York Art Ensemble, the California E.A.R. Unit, newEar, mezzo soprano Linda Hirst, soprano Rebecca Sherburn, clarinetist Alan Hacker, saxophonist Keith Michael Bohm, double bassist Corrado Canonici, percussionist Joby Burgess, and percussionist Chris Brannick. Lackey collaborated with choreographers: James Jordan, Andrew Lamar, Jennifer Owen and Charles Martin, visual artist Nate Fors and theatrical directors: Art Manke, Paul Mullins, Susan Gregg and Barry Kyle. His music was featured at the Festival of New American Music (Sacramento, CA), University of Central Missouri New Music Festival, the First Annual Society of Composers, National Student Conference (Austin,TX), the Fourth Annual Society of Composers, Inc. National Student Conference (Bowling Green, OH), and California’s Festival of the Arts. (performance May 2012), Odyssey Chamber Music Series (Spring 2013) and the newEar contemporary chamber ensemble (20th season 2012 - 2013). Recent commissions have come from Quixotic Performance Fusion and James Jordan in memory of Todd Bolender. 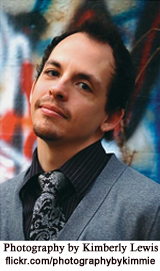 Lackey is a 2011 McKnight Visiting Composer with the American Composer Forum. He was selected to participate in the 2009 Etchings Festival for Contemporary Music at Moulin à Nef in Auvillar, France. In March 2009, Lackey was one of 24 Kansas City based artists selected to participate in the 2009 Creative Capitol Professional Development Workshop. Lackey was selected as a resident artist for Troika Ranch’s 2008 Live – I Workshop held at the 3LD Art and Technology Center in New York. In 2008, he received a Curatorial Honorarium from the Urban Culture Project. He studied with Samuel Adler for two summers (2002 & 2003) at the Bowdoin International Summer Music Festival. Dartington International Summer School awarded him the Hinrichsen Foundation Bursary to participate in the 2002-Advanced Composition Seminar instructed by Errollyn Wallen in Devon, England. Lackey has also studied with Stephen Jaffe at the 2001 Chamber Music Conference and Composers' Forum of the East (Bennington, VT) as a Composition Fellow. He was the winner of the 1998 New York Art Ensemble Young Composers Competition. In the summer of 1997, he studied with Dinu D. Ghezzo, Robert Rowe and Justin Dello Joio at New York University and participated in the "Music for the XXI Century" Festival. Lackey holds the M.M. and D.M.A. in music composition from the University of Missouri-Kansas City Conservatory of Music and Dance. While at UMKC, he studied composition with James Mobberley, Paul Rudy, Chen Yi, and Zhou Long. Lackey received his B.M. in theory/composition from Christopher Newport University where his primary composition teacher was Jennifer Margaret Barker. He has also received training at the Walden School’s Teachers Training Institute. Currently, he is Administrative Director of the Mizzou New Music Summer Festival, Admissions and Publicity Coordinator for the University of Missouri – Columbia School of Music, President of the Board of Directors for the newEar contemporary chamber ensemble (Kansas City, MO), Secretary for the Board of Directors of the Odyssey Chamber Music Series (Columbia, MO) and a member of the Board of Directors for the Kansas City Electronic Music and Arts Alliance (KcEMA).